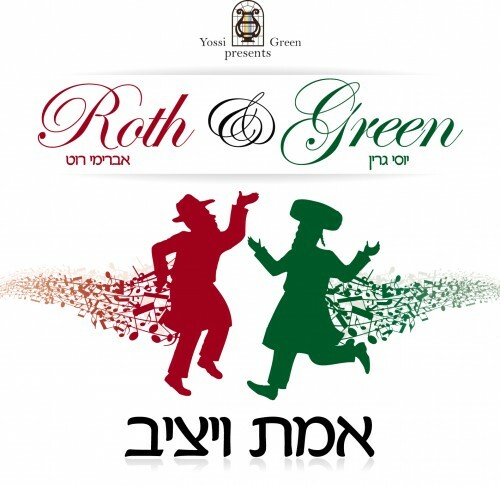 After two years of hard work, one of the greatest producers in Jewish music, Yossi Green presents the album: ‘Emet Ve’Yatziv’ – ‘Roth & Green’ together with singer Avremi Roth. The cooperation between the two of them, produced an album packed with 10 hits of which some of the unique ones are: ‘Hashem Elokeynu’ Avremi’s up-beat hit that was released a few weeks ago and captured radio stations and weddings of the sector, ‘Emet Ve’Yatziv’ the title song of the album and another up-beat hit, ‘Yetzave’ arranged in a very surprising Jazz style, ‘Zachor’ musically arranged by Dudi Roth (Brother of…) ‘Mi Adir’ a thrilling performance of a song that will accompany many Chuppa’s in the time to come, and of course ‘Moshe Ve’Aharon’ that has been categorized as one of the most refreshing renovation that has come out in the past few years. This album features some of the best musical artists, the world renowned pianist R’ Menahem Bristovsky’ Avi Singolda, Eyal Shiloah and the string band, while most of the musical arrangements can be attributed to the musical arranger Yehoshua Freid. In the last few days while the album was at its final stages of completion, Avremi’s father a man of charity and good deeds, R’ Levy Ben R’ Hillel Roth z”l passed away. Therefore, Avremi decided to dedicate any awakening that these songs may cause to the everlasting memory of his late father. In the past Avremi released two studio albums; ‘Ata Nigleta’ – Chazanut, ‘Malachei Hasharet’ – Singing, and another two ‘Zitz’ albums that were very favorably received and successfully achieved great popularity with hundreds of thousands of views on Avremi’s Youtube channel. These days Avremi returns from Mexico where he stands before the עמוד as he does every year during the High Holidays.